There’s nothing like the beauty that fresh and clean wood adds to the exterior of your home. Whether you have a fence, gazebo, deck, or any type of wood construction, well-kept wooden furniture is always a joy to entertain – even show off! But the appearance of your wood can easily be compromised by ultraviolet rays from sunlight, water from rain and snow, and mildew formation. These are the most destructive threats to your wood since they cause fading and damage over time. For wood construction placed outside of your home, exposure to sunlight, rain, and snow are inevitable. However, the damage is not. Contrary to what you may think, you can actually protect your wood and retain its beautiful appearance for many years to come. It all lies in choosing the right sealing agent. 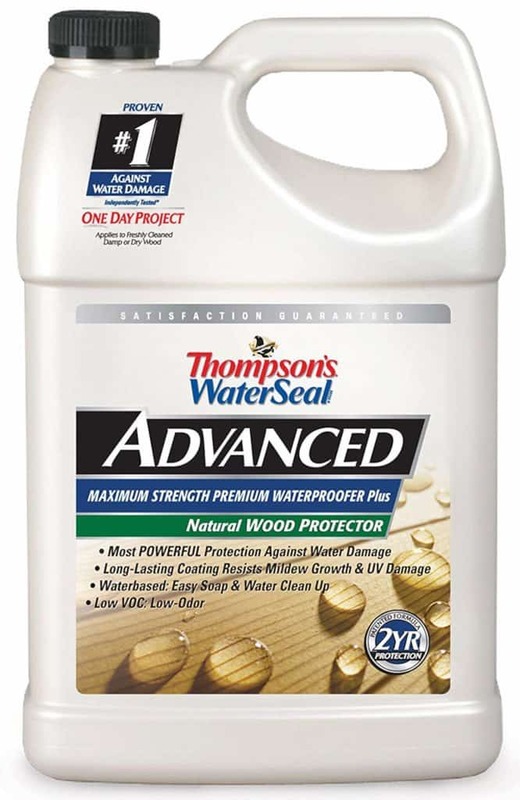 Meet the Thompson’s WaterSeal Advanced Natural Wood Protector: your best defense against water-related damage for wood. It does exactly what its name implies; this sealer has been formulated to protect natural wood in all its glory thanks to a water-based formula that fights mildew formation while shielding wood from ultraviolet rays and water. Thompson’s WaterSeal Advanced Natural Wood Protector doesn’t just guard your wood: it does so for many years. Its formula is designed for long-lasting protection from mildew, fading, UV and water damage. This easy-to-use waterproofing sealer results in enduring beading after one application. In fact, it just takes one day to apply one efficient coat! Thompson’s WaterSeal Advanced Maximum Strength Premium Waterproofer Plus Natural Wood Protector’s unique advantage is that it does such an excellent job at waterproofing your wood. That’s because moisture and wood are the main contributors to structural deterioration, rotting, mold, and mildew. This powerful sealer was designed for use on dry or damp wood; your exterior wood and furniture such as decks, gazebos, and fences will remain beautiful and free from fading and damage for years to come after your single-coat application. Each time you need to clean up, all you need is soap and water. It’s that easy! After application, Thompson’s WaterSeal Advanced Natural Wood Protector enhances the beauty of your wood. It doesn’t change the natural color of your furniture at all. It’s also good to know that its advanced patented formula lets you clean and treat your wood; you can even apply it to wood that has been freshly pressure-treated. There’s simply no other waterproof sealer like this on the market. Thompson’s WaterSeal Advanced Natural Wood Protector is a must-have for every homeowner with wooden furniture. It certainly does many things to defend your wood, but if we could choose one feature that truly stands out, that’s its powerful ability to resist water. You’ll notice water beads form on wooden surfaces after you’ve applied it; penetration is just impossible. This way you know that your wood is being protected from moisture and water from the inside out. Say goodbye to any worries of moisture-related damage to your beloved decks, fences, or gazebos. Just one gallon of Thompson’s WaterSeal Advanced Natural Wood Protector is all you need to cover 200 square feet of wood. That’s a lot of wood it can seal, so it definitely gives you more bang for your buck. Simply apply using a brush then let dry for 24 hours. Considering that you only need to apply one coat, this is a fantastic and economical purchase if you have a lot of wood outside. We wanted to see what homeowners had to say about Thompson’s WaterSeal Advanced Natural Wood Protector, so we looked at reviews online. Needless to say, we aren’t surprised that the reviews verify its outstanding quality. Homeowners highly recommend Thompson’s WaterSeal Advanced Natural Wood Protector; they observed that it dries fast and actually enhances the natural beauty of their furniture. They’ve written about the beautiful, light sheen that it leaves. During the winter, customers say that the snow beads up on the treated surfaces while ice thaws as well. In other words, it’s unbeatable waterproof protection, indeed. However, some customers find this sealer pricey. Taking good care of your wood is as much of an investment as the wood itself, so if you want to prevent unnecessary expenses associated with repairs and maintenance later on, you’re better off investing in a good sealer. There was also one homeowner who said that Thompson’s WaterSeal Advanced Natural Wood Protector left a yellow color as well as a slick on their deck. It was an isolated incident, so customers shouldn’t worry too much. Wooden furniture outside your home means nothing if its structural integrity has been compromised due to water or the elements. Thompson’s WaterSeal Advanced Natural Wood Protector is the #1 product you can trust to safeguard your wood efficiently. You can get a gallon of this shipped to you with ease, without ever having to leave your home. Several websites offer shipping within a few days for this product, such as Amazon. Water has nothing on your wood when you’ve got Thompson’s WaterSeal Advanced Maximum Strength Premium Waterproofer Plus Natural Wood Protector. It has a solid reputation for being the most powerful sealer that defends your deck against moisture and water, as well as ultraviolet damage, mold, mildew, and fading.